In the "Miniature Opera Project", space becomes an interactive score; the audience creates unique musical sequences by making choices about connective paths on a physical art piece. Each project installation centers on a large game board made of an array of light-sensitive tiles. Strategically positioned on the array, and illuminated from within, are “word nodes” or “character nodes” formulated to create a “stage of possibility” for an operatic libretto. In each iteration of the short opera, an audience member, or members, engage with the work by placing or tossing beanbags to create paths that connect the nodes, in a way that expresses the story they want to hear. 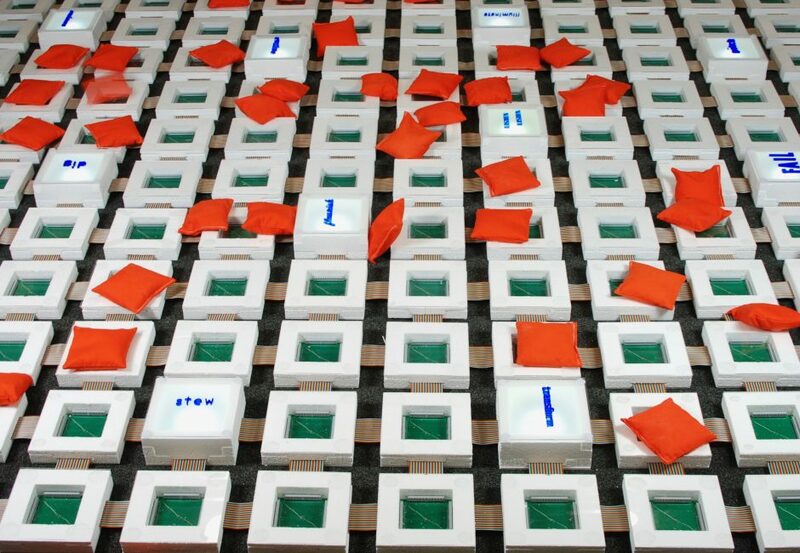 As they cover each light sensor in a tile, they trigger a unique musical gesture, shaped by its place in the sequence; if they complete a path from one node to another, a story-defining moment is added to the work.